Imagine Dragons And OneRepublic Locate Devotion In Pop Music's Details : The Record "Radioactive," by Imagine Dragons, just set a chart record for the longest run on Billboard's Hot 100. It's just one of a few songs on the charts showing the influence of religious themes. 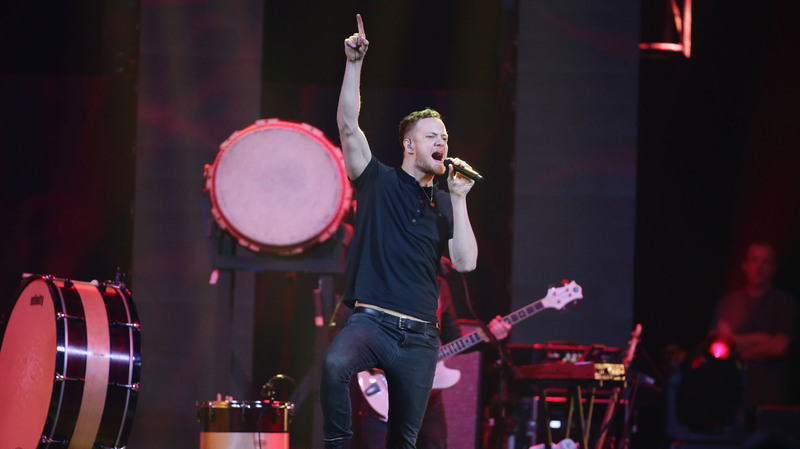 Dan Reynolds of Imagine Dragons performs onstage at the Amnesty International Concert presented by the CBGB Festival at Barclays Center on February 5, 2014 in New York City. This week, the rock band Imagine Dragons set a record for the longest run on Billboard's Hot 100 singles chart — 77 weeks, since it debuted in August of 2012. In an interview with Billboard, Imagine Dragons' lead singer, Dan Reynolds, attributes the song's longevity to its mix of sounds from different genres, which helped it cross over to multiple radio formats. NPR Music's pop critic, Ann Powers, agrees with that analysis, but adds that she hears another theme running through the song's lyrics. "It taps into one of rock's favorite subject areas, and that is religious or spiritual imagery," she tells Morning Edition's David Greene. "It's like an apocalyptic theme. It's end times. It's straight out of Revelation." Those images might come from the fact that members of Imagine Dragons are practicing members of the Mormon church (though the band has described itself as secular), but religious music is in the very roots of rock 'n' roll. And it bursts to the surface every once in a while, as it did in the the choral introduction to The Rolling Stones' 1969 classic "You Can't Always Get What You Want" and Madonna's 1989 No. 1 single "Like A Prayer." Over that time, the sound of rock has also made its way into contemporary Christian music on the radio and in big, non-denominational churches. "That's the power of pop music in America," Powers says. "It can absorb all of the most important influences in our lives. And certainly, for many, many people, spirituality [and] religion, specifically connected to Christian traditions, are important. It's hardly a new thing, but we always seem to crave it again." If the lyrics of "Radioactive" connect with New Testament teachings, OneRepublic's "Counting Stars," currently lodged in the top 10, taps directly into the sound of gospel. The band's lead singer, the pop songwriter for hire Ryan Tedder, has written hits in a variety of genres, for singers like Adele, Beyonce and Kelly Clarkson. Tedder, who grew up religious, has said he didn't want to be known as just a Christian singer. But his latest hit makes the connection explicit, especially in the near the song's end, when a gospel chorus shouts a call-and-response with Tedder, and in the video, which features a revival service.